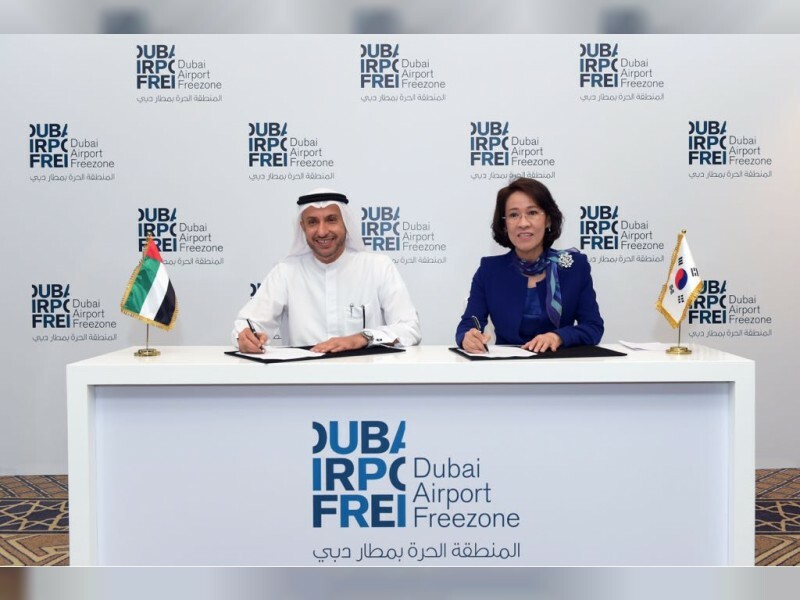 DUBAI, 13th June, 2018 (WAM) -- The Dubai Airport Freezone Authority, DAFZA, one of the UAE’s leading free zones, has announced a new strategic partnership with the Daegu-Gyeongbuk Free Economic Zone Authority, DGFEZA, in South Korea. The Memorandum of Understanding, MoU, will aim to increase collaboration between the two parties and expand bilateral trade between the free zones. The MoU was signed in the presence of Mohammed Al Zarooni, Director-General of DAFZA, and Inseon Lee, Commissioner of DGFEZA. DAFZA is a regional hub for leading Korean companies including KOLON GLOBAL, Halla Holdings, MOORIM, LEADERS, ATLASBX and SB and others. DAFZA runs a number of initiatives focused on increasing cooperation and business opportunities with South Korea, including recently welcoming a high-level official trade delegation from the Republic led by Hyun-Soo Kim, Consul General of South Korea. As part of the agreement, DAFZA and DGFEZA will work together to promote mutually beneficial investments and increase levels of knowledge transfer and information sharing on markets and trade. A major focus of the partnership will be on cooperation in information technology, innovation, cross-border e-commerce, shipping and logistics. DGFEZA will encourage South Korean investors to set up their businesses in DAFZA while at the same time DAFZA will facilitate offers and incentives to the companies from DGFEZA that have been referred as a result of the partnership. DAFZA will also encourage Dubai’s financial investors to invest in Korean-Dubai joint venture companies. Both parties will conduct high-level visits and consultations, particularly focusing on economic policies and business advisory services. Commenting on the agreement, Al Zarooni said, "The UAE and South Korea have strong economic and social ties and we believe this partnership will help strengthen the bonds that unite our two nations. This strategic agreement will create new trade and investment opportunities and allow us to showcase our world-class infrastructure and services. We will support South Korean companies interested in Dubai to set up operations and advise them on market conditions and opportunities. Ultimately, this will support Dubai’s long-term vision of creating sustainable economic development, a diversified and balanced economy as well as increased foreign investment from key international markets." "This is an important MoU with DAFZA and strengthens the strategic partnership between South Korea and the UAE. This was highlighted during the recent visit of the South Korean President, Moon-Jae In, to Dubai in which he showcased the collaboration between the two countries in key areas such as oil, gas, technology, IoT and smart-city projects," Lee said.